Like so many things for Tech men’s basketball this season, Jose Alvarado’s injury was sudden, intense and disappointing. One moment, the stalwart freshman point guard was having a middling start to a game against No. 9 Duke. His three turnovers certainly were not what the Jackets needed to keep themselves in the hunt against an excellent Blue Devils squad, but the New York native had shown over the course of the season that his occasionally follies are offset by flashes of brilliance. The Jackets were down, but there was nothing in particular to worry about. The next, Alvarado lay on the floor, clutching his elbow. It was fractured. Alvarado’s season was over. Like that, the inaugural campaign for a player who had seamlessly replaced four-year player Josh Heath was over. It was not the first time that Tech’s fortunes were changed in an instant. The bad luck started in the very first game of the season, an exhibition against Georgia State. Star guard Josh Okogie, fresh off a first year which defied all expectations and a key cog in the offense, fractured his thumb and missed much of the non-conference slate. The same went for suspensions levied against Okogie and senior Tadric Jackson, a mercurial guard who alternated boneheaded plays with acrobatic scores. 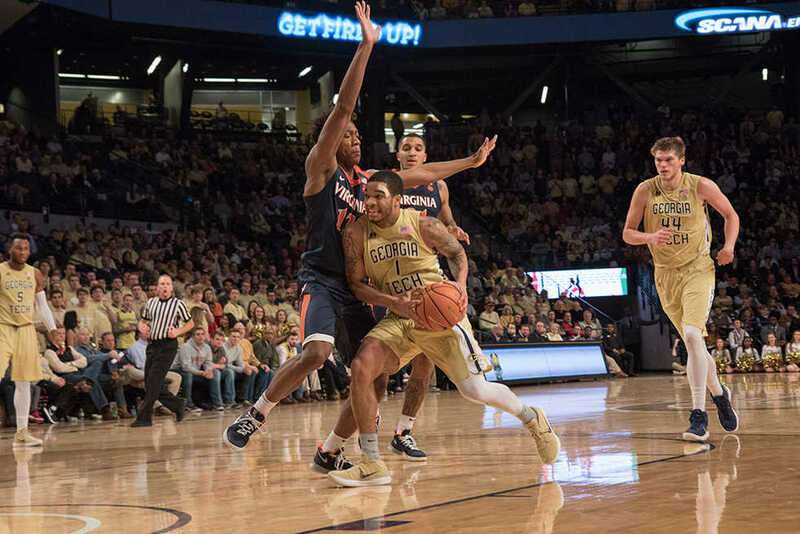 Yes, the Jackets should have been to dispatch Grambling State and Wofford without Okogie (and Wright State when Okogie was back, but still getting into the swing of things). Those should have been games in which undeveloped freshmen got valuable playing time and walk-ons got their 15 seconds of fame on the floor. But would a full-strength, conditioned Okogie have been useful in those games? Absolutely. And those early losses dug the Jackets into a hole from which they could not fully recover, particularly with a lack of depth across the board. Perhaps all of these points are moot if Ben Lammers’ ankle injury did not hobble him for much of the year. Lammers earned a reputation last season as a tenacious shot-blocker, a capable scorer from the post and mid-range, and a willing if not excellent rebounder. He played through the injury out of necessity — outside of maybe Abdoulaye Gueye, nobody on Tech’s roster could spell Lammers for more than a minute or two, let alone replace him for a full game — but was clearly a different player. Only recently has the senior returned to his top form. With only five games left before the conference tournament at the Barclays Center in Brooklyn, the cavalry is not arriving. There is no help on the way. The Jackets are who they have always been this year, and that will have to be enough. There will be no return bid to the NIT, let alone to the Big Dance. Indeed, finishing the season at .500 would be an accomplishment for this weary team. Yet there is still plenty to be gained from the last few games in the long run. Freshmen Moses Wright and Evan Cole saw their minutes take on a sharp uptick after Alvarado went down, a predictable result on a team more than happy to distribute its minutes to willing takers. More than any win on the scoreboard, significant contributions from Wright and Cole could be the real victory.